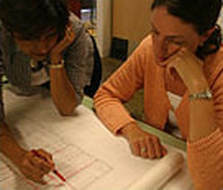 ​​If you've never worked with an architect before, you likely have questions. Does your project really require an architect? At what point should you involve a design team? What is it like to work with an AIA architect, and how do you get the most out of the experience? Here you can find answers and tools to guide you through the stages of design and watch clients and architects describe how the process worked for them.